During the game a player will produce many different events starting with simple ones and moving to more ambitious events. 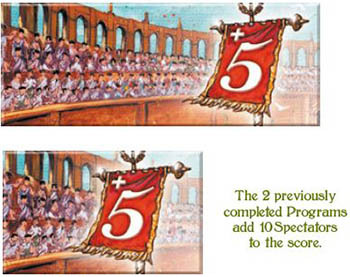 Each time a new event is presented, the Event Program of any previously produced events is turned over and counts for 5 additional spectators until the game ends. A player may choose to repeat events that they have produced in previous turns. In this case, the player turns the older Event Program face up to show she is producing that event. Any other previously produced events still count as 5 additional spectators. Any Event Programs held by the player that have not yet been produced are set aside and do not add 5 spectators. For example, if a player is running her third event, 2 "old" Event Programs are turned over and count for 10 (5+5) additional spectators. A Joker can be used to replace any standard asset token. When the event is performed, the player can decide what asset the joker will be used for. Note: A Joker is not used as part of the asset token count to determine if a player earns a Star Performer Award. When an Emperor Asset Token is acquired, it is immediately replaced by an Emperor Medal. If there are no Emperor Medals available, the Asset Token is lost. A player may make 2 investments instead of 1 during the investment phase. Of course the additional investment still requires the appropriate payment. The player can make the same type of investment twice during the same turn. It can be exchanged for an Emperor Medal at anytime. This ability can prove to be useful, particularly at the end of the game. The best producers are always able to attract the top performers. Among the asset types that include living performers, you will find Star Performers. 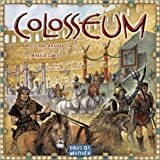 These assets include the: Gladiators, Priests, Comedians, Musicians, Lions, Horses and Ships (with their live crews). The first player to collect 3 (or more) matching Event Asset Tokens from among these performers is given the Star Performer Award for that asset type. At the time it is awarded the player must have more assets of that type than any other player. The number of tokens of that type held by the player drops to less than 3. If another player has 3 (or more) assets of that type and more than any other player, the Star Performer Award is then given to her. In case of a tie between several other players, no one gets the star. If the player who holds a Star Performer Award performs an event that uses the star's asset type she will attract 4 additional spectators. For example, a player with 3 Star Performers who produces an event that uses assets from 2 of those stars will add 8 (4+4) spectators to her event. Star Performer Awards may be given at the beginning of the game if, after the distribution of Asset Tokens, some players have 3 or more tokens of the same kind and no other player also has the same number of those tokens. 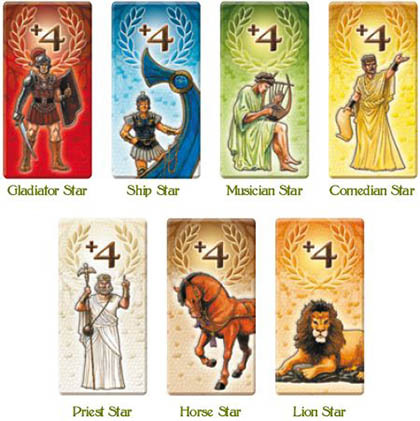 Star Performer Awards are placed in front of the player, along with their associated Asset Tokens, so that the other players can see them. When a Noble (Emperor, Consul or Senator) ends his journey via a dice roll on one of the resting areas. If a player has combined the result of both dice to move one Noble, the Emperor Medal is collected only if the Noble ends his journey on a resting area. By collecting a Special Event Token (Emperor and Additional Actions) that can be exchanged for an Emperor Medal. Emperor Medals are collected as long as they are available. Note: If a player uses an Emperor Medal to move a Noble onto a resting area, she does NOT collect an Emperor Medal. Emperor Medals are only collected when Nobles are moved through a dice roll. Add 3 spectators to an event when producing the event. Move any Noble 1, 2 or 3 squares forward or backward. (This movement must be made after moving the Nobles via the dice roll). By playing 2 Emperor Medals, instead of the 3 possible actions described above, a player can make a second investment during the investment phase. There are no restrictions on the number of Emperor Medals that can be played. For example, several Emperor Medals can be played in a row to move a Noble multiple times or to move a second Noble. Once earned, Emperor Medals can be used immediately during that phase or kept to be used later.